INFINITY #8 - Blake's 7 is 40 - from the UK! 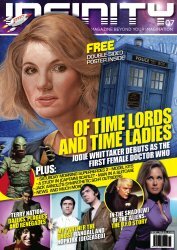 MyMovieMonsters.com > Monster Magazine Marketplace > INFINITY (UK) > INFINITY #8 - Blake's 7 is 40 - from the UK! From the publishers of The Dark Side in the United Kingdom comes INFINITY, a new magazine dedicated to sci-fi and fantasy. This is Issue #8, featuring "Blake's 7 is 40" Celebrating the Anniversary of the Terry Nation Classic. Lost in Space: "Danger Will Robinson!" Glossy full color 68 pages. Copyright 2018 Ghoulish Publishing. Missed Issue #07? Use the convenient Buy Both button below!